Even though we’re a ways off from summer, the nice weather here in SoCal makes it feel like summer all year long. For a few years there, I kind of dreaded the beginning of summer because it meant my lease was up and we’d have to move. That was in college though when I was living with different people every year and moving around a lot. My living situation remained pretty fluid for a couple years after I got out of school too since some of my friends were holding out for work in other areas. But even though I moved around a lot during the past 10 years, I never really had that much stuff. Since I knew we’d probably be moving, I never bought more than a bed and a desk. When it came time to move, I’d strap down my bed to my sedan, disassemble my desk and load up my car. It also helped that all of my moves were always from one part of the city to another; I never had to leave the county. That enabled me to take a couple trips or spread my move out over a few days. But that all changed when I bought my condo. After I bought my condo in 2010, I knew we were going to be there for a while. So we ended up buying furniture, artwork, beds and more. Eventually, when it came time to move though, we had accumulated a lot of stuff. I debated over whether we should hire movers or not and it was a very tough decision for a real cheapskate like me. Ultimately though, I couldn’t have been happier with the choice I made. Since we were moving about an hour north, there was no way I could strap everything to my car and make multiple trips. If we were going to do it ourselves, we would need to hire a moving truck and enlist the help of a few friends. Moving trucks can be pretty expensive though and you also have to factor in the time/money it takes coming back for your car. All of the companies I contacted charged an extra fee for one-way drop-off so that wasn’t an option either. The lowest quote we ended up finding was around $300. The next part of my search involved comparing quotes from local moving companies. 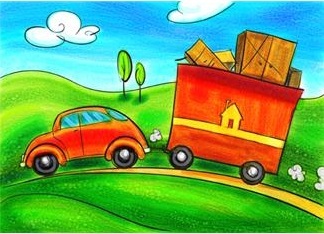 There are a few nifty moving quote comparison sites out there but I used movingrelocation.com. The best quote(from a highly rated company) I got was from a local company and it came in at $750. $750 vs $300 is a big difference but I honestly felt like the price for hiring movers wasn’t as much as I thought it would be and the cost of renting a truck was way more than I thought it would be. I also knew that it would be 80-90 degrees in the middle of July and although I like doing things myself, moving isn’t really one of them. Similar to my ‘house cleaner conundrum‘, I don’t get much value out of moving all my crap so I figured it might be a good idea to pay someone to do it for me. I knew it would be too much work for my fiancee and I to pack up and move our entire two bedroom apartment, so the other option I considered was enlisting the help of my friends. I always feel awkward though asking people to help me move unless I’m really close with them. I actually like helping others move but I don’t like moving my own stuff for some reason. It makes me feel good to help my friends out, plus I get a nice little work out in, a free meal and some beers if I’m lucky. Since we had to move during the middle of the week though, it would have been tough for my friends to help because they all have day jobs. The thing that finally convinced me though was when I learned that the entire cost of my move would be an above the line deduction. Since I was moving for another job(TBD at the time, but I was pretty sure I’d find work), I qualified for the moving expenses deduction. My marginal tax rate(fed/state/FICA) is around 40% so my $750 move only cost me $450 after the tax deduction. The temperature on moving day was about 90 degrees and the moving company did an awesome job. They didn’t take one break during the entire time: I bought them a couple Gatorades but they didn’t even drink them until the whole move was done. It ended up taking two guys 3 hours to load the truck, an hour to drive, and 2 hours to unload. I was actually surprised they were able to fit my entire 2 bedroom and 2 bathroom apartment into a 17 ft. truck(with room to spare) but I suppose that’s why they’re professional movers. I was pretty happy with my decision to hire movers but I think it may have spoiled me for future moves. I spent most of the loading phase just sitting around telling them what to do while they sweated their asses off. And it really didn’t cost me much in the long run since I would have had to rent a truck anyways. Our lease is expiring this summer and if we decide to move I think I know which way I’m leaning. Readers, ever hired movers to help you move your stuff across town, state or country? Does the time of year you’re moving play any role in your decision?